So, you’ve recently picked up a guitar and got bored with your sound already – it’s time for your first guitar pedal, don’t you think? Choosing it might be easy if you know precisely what you want and where to look, but like the vast majority of beginner guitar players – it can be a pretty frustrating task. What we’re going to do now is help you understand all you need to know about picking guitar effects pedals for beginners, and best of all – we’ll break it down into a few helpful sections so that there’s absolutely no room for error. 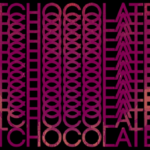 Without any further ado, let’s get straight to it. First and foremost, you should try getting a pedal that can give you a ‘familiar sound’. As you continue to progress you will experiment with a plethora of different effect pedals, but for the time being, you’re just getting one pedal, right? So let’s make it count. 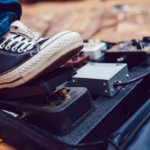 Now, there’s bound to be an artist or two that you like more than most, so in order to get your sound as close to theirs, you should do a bit of research on the guitar pedals they are using to achieve their tones. 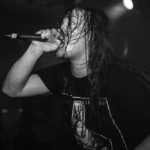 Check out what they’re using for live performances, read interviews where they talk about gear, or (if you can) go to one of their shows and ask them. Of course, you could just Google it, but actually hearing and reading about how they use their pedals can give you a better understanding of the sounds they can make. Side note: you should keep in mind that professionals use a wide variety of pedals atop pro-grade equipment, so the sound you’ll hear will probably be the best case scenario. Since you won’t have a stack of Marshalls at home or a guitar worth several thousands of dollars, your sound will be a bit smaller, but don’t beat yourself up over it – you’ll get there one day! There is a massive world of different guitar effect pedal types, and that’s just one of the reasons that picking just one is so hard. However, although there are some 8-10 main types, we can easily divide them in two categories – primary and complementary. 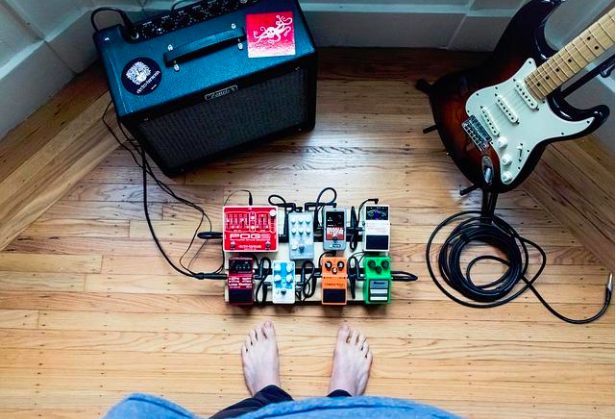 Primary pedals alter the sound – distortion, pitch shifters, fuzz, reverb, and such – while complementary pedals affect your playing in a more subtle way. For example, a looper pedal, like a TC Electronic Ditto Looper, allows you to record and layer riffs on top of one another. While “complementary” pedals like these are wildly useful, they aren’t always the best pick for your first guitar pedal. After all, you want to discover a good tone first so you aren’t layering bad tone on top of bad tone. 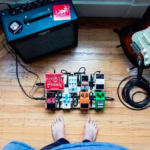 The reason why most beginner players start with a distortion or overdrive pedal is that these pedals alter the tone in a very substantial way, and are usually a great option for breaking into the world of guitar pedals. 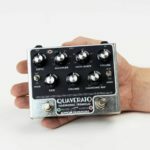 Depending on your playing style and musical preferences, you should pick an overdrive for somewhat ‘lighter’ music, or distortion or fuzz pedal for rock, hard rock, or metal. Of course, you can easily decide that you want a delay pedal to be your first, but don’t expect too much out of it if it doesn’t complement the driven/distorted/fuzzed sound the primary pedals offer. Now that you have an idea of what pedal types exist, it’s time to search up some names. Basically, there are hundreds, if not thousands of guitar pedal manufacturers and brands – this is the main reason why picking a pedal these days is so bittersweet in a sense. It’s hard to say which brands are the best (because that solely rests on what you’re after), but some of the more popular brands are Boss, Digitech, and Zoom. These brands are a great place to start looking for your first guitar pedal. Doing a little research here is also recommended. You don’t need to memorize the history of these brands, but it wouldn’t hurt to check out official articles about Brand’s signature artists. In essence, professionals need equipment, and they’re using models from certain brands, so looking back at the first tip we gave you – checking out what pedals your favorite artists and guitarists use can give you an idea of what you want. By now you should have at least an idea of what guitar pedal you want. It could be a Boss OS-2, a Digitech Mosaic or a Carcosa fuzz, or even a Fender Pugilist, but how can you actually choose between such a wide variety of premium quality beginner pedals? It’s quite simple – you’ll narrow down your list quite a bit by checking out the price tags. Just like with everything else, guitar pedals fall into different price point categories. There are pedals that are just below $20, for example, are Donner and Behringer models, but there are also boutique level pedals such as Chase Bliss Audio’s and Strymon’s pedals which are much more expensive. Most beginner guitarists are already decimated by the price they’ve paid for their guitar and amp, leaving them with little money to actually buy a pedal. If that’s the case with you, don’t bum yourself out that you can’t get the best pedal possible – there are a lot of high-quality guitar pedals in the low budget price range too. There’s another thing that most beginner guitarists do after they realize how much premium quality pedals cost – they actually end up buying two low-cost models. Now, even though we did mention that there are great pedals in the budget category, it will take some time and effort to find one, let alone two. Also, if you’re a beginner guitarist buying your first pedal – you may not know a lot about tweaking with knobs, wiring up your pedals, or the order in which the pedals are supposed to be placed in the line. So its best to take your time and learn one pedal inside and out. There are a lot of things you will eventually learn, but know that ‘less is more’ in this respect. It also refers to the fact that you should check out each control knob individually, as opposed to cranking them all up to the max and hoping for the best. With a bit of patience and some time, the pedal you’ve chosen will actually get to shine, you will have mastered it in a month or two.